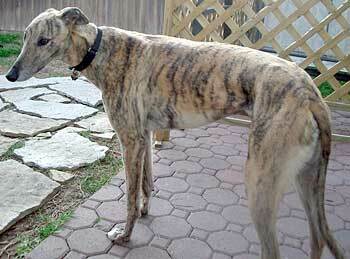 Striker, aka Kson's Spiker, is a handsome almost 4-year-old red brindle male born July 1, 2003. His sire is Oshkosh Slammer and his dam is Tamerin. 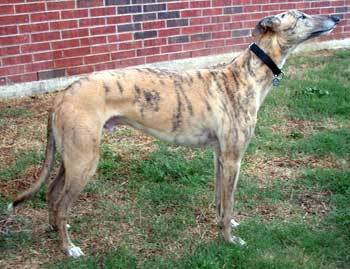 Striker's racing career consisted of 74 races starting March 21, 2005 at Southland in West Memphis, Arkansas, and ending August 9, 2006 at Gulf Greyhound Park in La Marque, Texas. 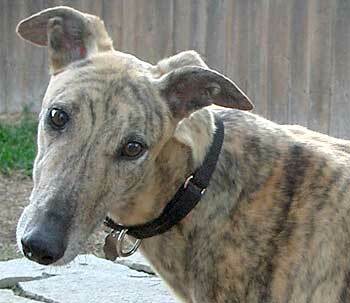 Striker was in a home for a short while but it was not to be his forever home. He is a sweet, loving, and very affectionate boy. Striker is not cat tolerant and it is not known at this time if he is small animal tolerant.